Portable restroom cleaning doesn't get any easier than this. Alfa Laval's all-in-one Portable Restroom Cleaning System has helped make one of the worlds dirtiest jobs simpler and faster, drastically lowering costs of water and reducing man-hours. With the Portable Restroom Cleaning System, you can clean any porta-potty in less than 10 minutes without brushing or spraying. The system has a custom made stand for cleaning the cabin with the door closed as well as a seat cover for cleaning in the holding tank with fitted suction pipes to allow for draining while cleaning. 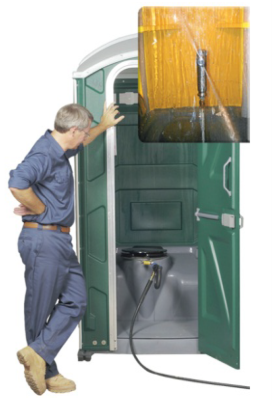 Applying impingement cleaning to the portable restroom industry has saved companies thousands of dollars. The powerful rotating jets of water projected from the GJ 9 in a 360 degree pattern quickly cleans the unit interior and holding tank, in a fast and efficient manner using less time and water than other methods. Even tip-overs are a breeze to clean using a GJ 9 Cleaning System. Fast: Clean any portapotty in less than 8 minutes. Eliminate odor: Clean the entire holding tank including the top. Alfa Laval's rotary impingement tank cleaning technology ensures the entire holding tank and cabin is cleaned. The power of the GJ 9 will blast off any residue, especially the built up waste in holding tanks, allowing for less deodorants and chemicals. Suction out bulk waste in holding tank. Connect hose to Alfa Laval splash guard. Connect tank cleaning machine onto splash guard and place into holding tank. Use Alfa Laval adaptor to reduce 2” hose to Alfa Laval suction pipe and place in hole of splash guard. Turn on pressure washer and suction pump (to ensure holding tank does not fill). Allow Alfa Laval tank cleaning machine to clean for 4 minutes. Turn off pumps and connect hose from pressure washer to custom Alfa Laval stand, as well as the GJ 9. Place stand in cabin, remove toilet paper, and close door. (Door will not completely close due to hose). Let the Alfa Laval tank cleaning machine run for 4 minutes, water will run out the bottom. Cleaning is now complete. Cleaning time can be reduced based on the level of dirt and residue.